Yesterday, news came in – now confirmed - that a 22-year-old Nigerian, Mustapha Muyeedeen Mofoluwasho Opobiyi, was shot down during the Ilorin, Kwara State protests in another unacceptable case of police brutality. While young Nigerians across the country are joined together in mourning for this terrible and entirely avoidable loss of another one of us, it lends an even greater urgency to the widely condemned removal of the infamous fuel subsidy through a press release by PPPRA. s that consultations will continue; it is obvious that they deliberately misled Nigerians. In typical fashion of a bloated-government, a 22-member committee has been set up to manage the imaginary savings. Will these savings be the theoretical cost of the subsidy – minus cost of corruption - or the current (inflated) figure? Also, how does the government intend to remit same to this proposed quasi-government agency? Will this necessitate the setting up of another special account, in the manner of the Excess Crude Account? Setting up a new body means an increase in recurrent expenditure for staffing, salaries, pensions, cars, running costs etc. This is UNACCEPTABLE. In addition, a review of the Subsidy Reinvestment and Empowerment Programme (SURE) document shows at least 5 projects that contracts have already been awarded for. A recurring contract is the Lagos – Benin Road; the same road that the current Minister of Petroleum Resources cried at the deplorable state as Minister of Transport in 2007. The Mambilla Power Plant was awarded under the Obasanjo Administration, mobilization funds were released and the Yar’Adua Administration cancelled the contract. The funds are yet to make it back to the federation account. It is also instructive that the President has belatedly set up a committee to ‘resolve’ the crisis arising from the fuel subsidy removal. We request that no well-meaning Nigerian opposed to the removal should attend any such “arrangee” meeting. The message from the Nigerian Government is simply that they can afford to waste money and Nigerians should pay for it. Nigerians are resilient, but we can no longer afford to pay for government’s inefficiencies. It’s too expensive (financially; productive man hours and human lives) and it’s also NOT sustainable. 1. Return to Status Quo. Pump price returned to N65. 2. Reduce Cost of Governance. The government must drastically cut down the cost of maintaining public and civil servants – security votes, multiple advisers, fuel guzzling convoys, excessive foreign travel and estacodes etc. • How can we build another house for the Vice-President at N7 bn ($43.75m) and an additional N9 bn ($56.25m) is being requested to complete it? • N1 billion on miscellaneous expenses include honorarium & sitting allowances; welfare packages and publicity & advertisements. These expenses are criminal and unsustainable. • No one knows the exact amount NNPC makes or the exact amount of fuel consumed per day in Nigeria, hence the figures being touted and which give rise to the N1.3 trillion last year are not accurate. • Why does NNPC get 445,000 barrels of crude a day that it can’t refine? • In 2006, there were 3 marketers; we now have 77. According to BusinessDay, “the increase has also been linked to [the 2011 elections] and it has been suggested that the subsidy programme became an avenue for patronage extended to those with political connections.” Significant savings can be made on the bandied N1.3 trillion if the government will prune out the “briefcase marketers”. • Our refineries operate at 30% capacity. Billions have been earmarked for upgrades and maintenance over the last 12 years, with no impact. Increasing the capacity of our refineries would reduce the amount of fuel that needs to be imported into the country. • According to a 2009 report by the Nigerian Electricity Regulatory Agency (NERC), Nigerians spend N797 billion yearly to buy fuel for powering generators. 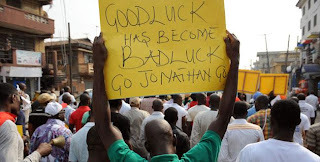 • In 2010, President Jonathan said the cost of fuel (to power generators) was $13 billion. • NERC’s estimates 32% of generator fuel is PMS. This means Nigerians spend about $4.19 billion or N646 billion on petrol, while the rest goes to diesel. • With this unnecessary hike in pump prices, the cost of maintaining generators in Nigeria will also increase almost 150%. Imagine how much fuel import dependence we can curb if this government fulfills the often-repeated promise of improving power supply in Nigeria! In the words of a popular adage, the Federal Government has, yet again, left leprosy to treat ringworm Enough is Enough Nigeria has put structures in place to join other pro-democracy forces to ensure that the democratically elected government of Nigeria is truly a government of the people, by the people, for the people. EnoughisEnough Nigeria (www.eienigeria.org) is a coalition of individuals and youth-led organizations committed to instituting a culture of good governance and public accountability in Nigeria through advocacy, activism and the mobilization of the youth population as responsible citizens. The coalition includes The Future Project; Paradigm Initiative Nigeria; Education as a Vaccine (EVA); Kudirat Initiative for Democracy (KIND); RISE Networks; Chocolate City Group; EME and Light Up Nigeria.